Was St Thomas called “The Twin” because he had two sides to his personality – a bit like you and me? Fr John Murray PP gives us some insights into the personality of the one we also know as “the doubter”. It’s hard to believe, sometimes. When the tsunami hit the shores of Asia on 26 December 2004, there were some who said, ‘If God does exist, then he’s cruel’. A mudslide in the Philippines, a ship sinking off the coast of Egypt, a tragic war in Darfur and endless suicide bombs in Iraq: the list goes on. Why do the good suffer and the bad seem to prosper? Does God care? And if he does care, is he powerless to do anything? Those big questions are also mirrored in the personal tragedies of many people: the father and mother watching their little daughter die of leukaemia; the parents burying their teenage son who has taken his own life; the girl who went out with friends for the night and can’t remember why she ended up in a field with her clothes torn. Our questions can go on and on. Is there really an ‘intelligent design’ behind this vast universe? Is Jesus really present in that tiny host? Where is my grandmother who passed away a month ago? Everyone of us in life asks the question ‘why?’ many times, and sometimes we don’t always have ready answers. That is why I like Thomas, the saint who doubted and yet found Jesus at the end of his doubt. The gospels tell us that Thomas was called ‘The Twin‘ and, since there is no record of a brother or sister, I like to think that this was a nickname given him by the other apostles when perhaps they were joking with each other. Just as James and John were nicknamed Boanerges or ‘the Sons of Thunder‘ – probably after they had asked the Lord if they could call down fire on a village which had refused them entry and just as, later, Barnabas would be called ‘The Encourager’ (Acts 4:36), so Thomas was Didymus or ‘The Twin’, the one who, perhaps, had two sides to his personality a bit like you and me at times! Thomas could be wild and extravagant and full of faith, as he was when he wanted to go and die with Jesus, as Jesus was setting off to help his friend, Lazarus. He was also the one who wondered where on earth they were going when Jesus spoke about his journey: ‘Lord, we don’t know where you are going, so how can we know the way?’ His question evoked from the Lord this wonderful reply: ‘I am the Way, the Truth and the Life’ (Jn.14:5-6). Most of all, however, Thomas is associated with a certain episode after the resurrection, when Jesus returned to the Upper Room and Thomas was not there. One wonders at his absence. Why was he not there? Had he got cold feet? Was he out getting food for the others? Who knows? The impetuous disciple could not believe the others when they told him that Jesus had been with them: ‘Unless I see the holes that the nails made… and can put my finger into the holes, and unless I can put my hand into his side, I refuse to believe’ (In.20.25). Ever the pragmatic one, he demanded proof. These things did Thomas hold for real: the warmth of blood, the chill of steel, the grain of wood, the heft of stone, the last frail twitch of blood and bone. 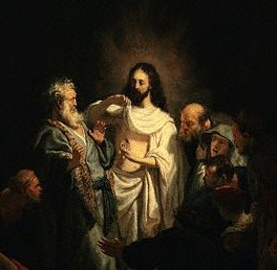 When Jesus returned, he invited Thomas to experience for himself both passion and resurrection: ‘Put your hands here… doubt no longer, but believe’. 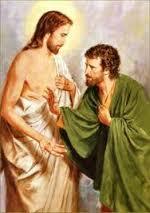 His fellow apostle wrote that Thomas could only gasp, ‘My Lord and my God!’ (Jn.20:27-28). A writer once penned these words: ‘I looked for God, and could not find him; I looked for my soul, and could not find it; I looked for my brother, and found all three‘. 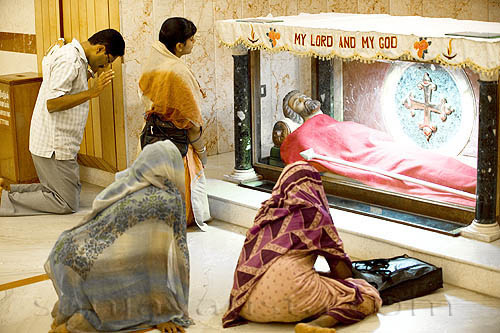 Mother Teresa would find Christ in the ‘distressing disguise of the poor‘. ‘During the day, we continue to see him hidden beneath the torn bodies of the poor,’ she would say. Father Damien would find him in the lepers of Molokai, and they knew the Lord better the morning Damien began Mass by saying, ‘We lepers‘. It is in and with the suffering Christ that we often meet his risen presence. When Dominique Lapierre, the novelist and writer of the The City of God – made into a film later visited Calcutta, he entered the house where Mother Teresa was working. He approached her as she was feeding a man who was scarcely alive. He greeted her, but instead of stopping what she was doing, she gave him the bowl, and told him to continue feeding the poor man, as she moved to another person. Later, she returned to allow him to interview her. Lapierre later claimed that that one moment taught him to recognize the suffering and the risen Christ together. There is one last reference to Thomas in the gospel of John. It is in one of the post-resurrection accounts. Jesus appears at the shore, and Thomas is with them. Now there is no doubt. He tells them to cast out into the lake: it is reminiscent of the earlier occasion when Peter is given his original mandate to become a ‘fisher of men’. The result is the same in this case, too: a miraculous catch of fish. And the message is also the same: to become fishers of men. Thomas was to take up this challenge after the Lord had returned to the Father. Tradition says that, following the dispersal of the apostles after Pentecost, Thomas went to evangelize the Parthians and Persians. Ultimately, the story goes, he reached India, and carried the faith to the Malabar coast. There are still Christians there who trace their faith back to Thomas, one of the oldest Christian traditions in the history of the Church, four hundred years before Patrick came to Irish shores. Thomas would end his life speared to death for the Lord. Once, he had denied him and was full of doubts, but in his martyrdom he witnessed in the most glorious way a disciple could.